The $61,000 prize pool World Arena Championship took place on Saturday at the Microsoft Theater in LA. Finalists from around the world traveled there to compete against one another at the center of a vast, neon-lit stage with only their tablets. The competition was also a loosely camouflaged marketing event for the Summoners War’s publisher, Com2Us, and its future plans for the micotransaction-heavy game. 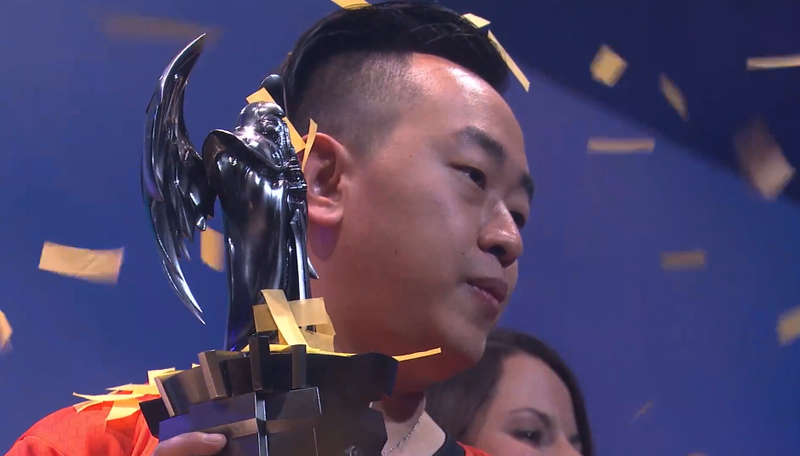 In addition though, it was the first opportunity for some of the most devoted players to finally get recognized on an international stage after years of meticulously trying to optimize their monsters’ stats. Tomato, a favorite going into the tournament, was clearly one of the top players to anyone watching. He was still somewhat suprised he went on to win the whole thing though, citing the qualifications of his opponent, PSY! and chalking victory up to luck. His relief at winning was most evident as he stood on stage holding the novelty $20,000 check for first-place. When the hosts tried to take it away from him so he could hold up the championship trophy. He reluctantly held on for seconds that felt like an eternity to anyone watching. He clearly spent a lot of money on the game to get to where he was, and a lot to fly out to LA as well. While Tomato refused to say anything to the crowd, he did explain that he’d be using the prize winnings to help recoup his travel costs. Summoners War is a very popular South Korean mobile game. It’s like Pokémon crossed with the combat of one of the older Final Fantasy games. Players unlock monsters to fight at their side and grind for in-game resources in order to power them up. There’s also a player-vs-player mode where people get duel one another with the monsters they’ve been building up. Unlike in Pokémon, however, each side consists of four different characters fighting simultaneously. If you’re into MMOs and also small sprites unleashing familiar patterns of attack, Summoners War is the game for you, especially since it can be taken on the go, allowing people to repetitively grind anywhere in the world, like Pokémon Go but with a veneer for strategy. In competitive play, this means selecting the right match-ups between your monsters and your opponent’s, and hoping the random number generation behind when their special abilities trigger hashes out in your favor. Tomato proved the most adept at navigating those granular intricacies and as a result picked up enough cash to keep building out elite monster squad for years to come. You can re-watch the entire event below.